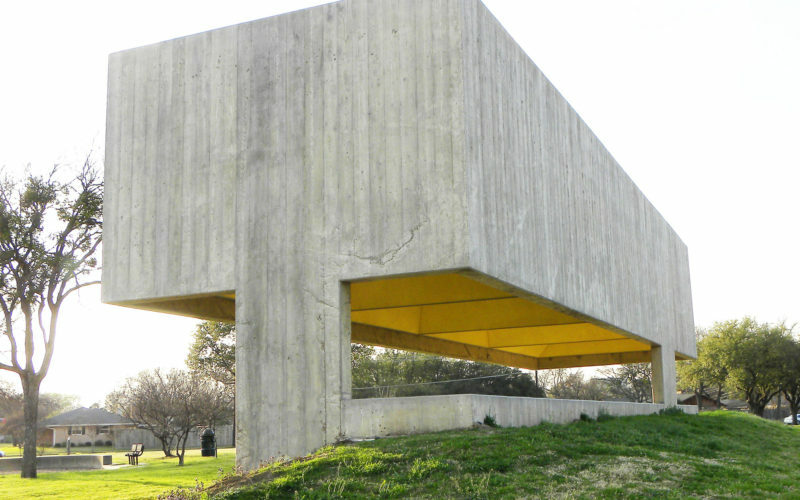 New York–based Cooper Joseph Studio’s new concrete shade pavilion is more than a simple structural canopy, it creates a new sculptural landmark in a public park in Dallas. In many municipalities, public shade structures can be an afterthought: Prop a canopy on some posts, and shade you shall have. Not so in Dallas, Texas. Two bond referenda there, in 2003 and 2006, allocated money to replace some 30 of the city’s park pavilions, and Dallas Park & Recreation assistant director Willis C. Winters, FAIA, envisioned something rather ambitious: The city would treat each pavilion as a distinct commission, hiring architects—including firms such as Lake|Flato Architects, Elliott and Associates, and Snøhetta—to design the park structures. For Webb Chapel Park, in a residential area northwest of downtown, Winters tapped New York–based Cooper Joseph Studio, which had earned acclaim in Dallas with the Women’s Museum, designed by partner Wendy Evans Joseph, FAIA. The commission came with loosely defined program requirements: shade, seating, durability, and ample sightlines through the space. The old pavilions being replaced were simple concrete T-beam shade canopies. Cooper Joseph turned to the same material for its Webb Chapel Park Pavilion. "Dallas is known for the quality of its concrete industry, so for us, it was the perfect material for a small structure with integrity and boldness," Evans Joseph says. But the architects modified their approach in formally and functionally inventive ways.